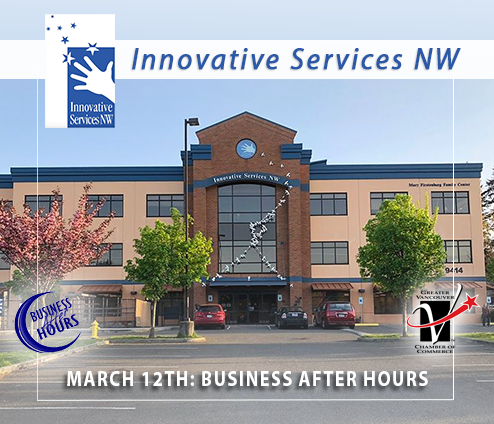 Join us at our March edition of Business After Hours at Innovative Services NW. This organization was featured as our non-profit partner of the year in 2018 for their incredible work they do for children with disabilities. Not only does Innovative Services NW enhance the lives of youths with disabilities, but they encourage better quality of life for everyone around us. On Tuesday, March 12th, we will explore this huge space at a Business After Hours Scavenger Hunt where we will find our way around this hidden gem in our community. Drinks and amazing hors d'oeuvres will be prepared by Innovative's Chef Mike. Doors open at 5:00p.m., and be sure to bring plenty of business cards as we will have door prizes announced around 6:00p.m.